PRK (photorefractive keratectomy) is a laser vision correction procedure performed by Dr. Brian at his office in Beverly Hills. The procedure involves gently moving the surface skin of the cornea and applying a laser to reshape the outer cornea. PRK was the first type of laser eye surgery for vision correction. PRK preceded development of LASIK. 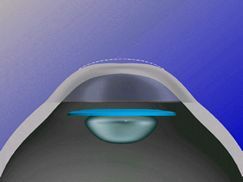 PRK does not require the creation of a flap; instead, a solution is applied to the eye and the laser is then applied to the surface of the cornea to reshape it. The surface skin heals over the treated area. The visual results of PRK are similar to LASIK; however, vision is typically slower to recover. This 5-10 minute procedure can treat nearsightedness, farsightedness, and astigmatism. Potential benefit is improved vision and potential risks are infection, inflammation and haze, among others. That is the reason that Dr. Brian and every staff member here are highly “detail-oriented” about each step of the process for every patient. 15 year-old PRK is very different than the modern-day PRK. Specialized drops and contact lenses are used postoperatively so the procedure is not typically painful in the way “old style” PRK was a decade ago. If you had a cornea transplant and are experiencing vision problems from Astigmatism and other distortions, please click here to learn how you can be helped with Dr. Brian’s specialized PRK for cornea transplants. how PRK with Dr. Brian changed his career.